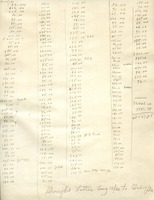 This is a scratch sheet of numbers calculating the amount of money brought in from the drought appeal letters from August 12, 1930 to October 17, 1930. Mrs. A. B. Hill sends $5 for a rug from Sunshine Cottage. Receipt written on the back of an appeal letter signed by Martha Berry. Mrs. Walter B. James sends $150 to The Berry Schools. 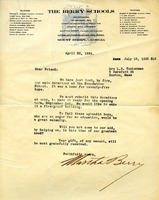 A letter asking for a donation of twenty-five hundred dollars to be given to the Berry Schools. 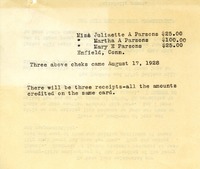 Miss Juliaette A. Parsons sends $25, Miss Martha A. Parsons sends $100, and Mary E. Parsons sends $25. A note from the Berry office says that there will be three receipts but all the amounts will be credited on the same card. This donation has been made in memory of Eva Morris Hawks. It was in response to an appeal letter about a family of girls that is in need of scholarship money to stay off of the streets and at the Berry School. 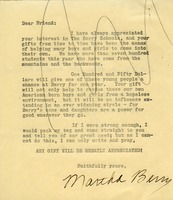 In this letter Martha Berry is thanking Miss Carlott Mabury for her donation of fifty dollars, and invites her to stay at the Berry Schools if she ever comes to Georgia. 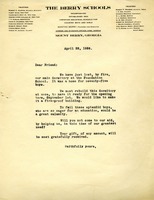 Mrs. W. D. Southwick sends $5 in response to an appeal letter. 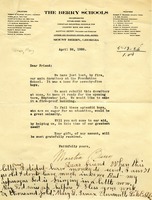 This is an appeal response from Mrs. Frederick Prat for one hundred and fifty dollars. Martha Berry appeals for scholarship funds to provide opportunities to the next generation. Martha Berry sends out what appears to be a mass letter asking for funds to help rebuild the dorm that was destroyed due to fire. Mary E. Tenax writes to Martha Berry offering a small donation in response to an appeal from money she made from her asparagus bed.